Shostakovich�s Fourth Symphony has a chequered history. Written just after Lady Macbeth of the Mtensk District and with music in similar vein, it too had to be withdrawn. Unlike the opera, which had attracted bad press and the attention of Stalin, the symphony had only reached the rehearsal stage. The orchestral score then disappeared and the première had to wait a quarter of a century and until several years had elapsed after the death of Stalin. 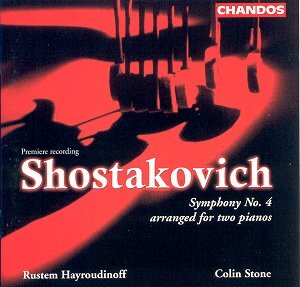 At the time of its composition Shostakovich made a "straight" arrangement of the Fourth Symphony for two pianos. He performed it privately in 1945 with fellow composer Vainberg and subsequently managed to publish the score, circulation of which was then banned. In 1960 the young composer Tischenko did perform it in public with Dmitriev and the orchestral parts resurfaced soon afterwards. Finally, in the following year, the work was heard as the composer originally intended. The two-piano arrangement was eventually republished in 2000. Several points arise from the history of this work: Why did the composer make the transcription? Would the work perhaps have been lost for ever without it? Have there been any performances of the arrangement other than the ones mentioned above? Certainly the work has not been recorded before and until this disc arrived there must be few people around who have heard it in this form. Any thoughts on these points or previous experience of hearing the two-piano arrangement would be welcome on the MusicWeb Bulletin Board. The Fourth Symphony has a symmetrical three movements with a fairly short middle movement sandwiched between two much larger structures. Mahler is the most obvious influence but there is a level of violence in the opening movement that is comparable with Prokofiev�s Second Symphony � a work which was written about ten years earlier. There is also much that is characteristic of the composer � for example irony and pathos. It is not a comfortable ride but is increasingly recognized as being one of the composer�s greater works. In writing the previous paragraph, the orchestral version was in my mind. Of course, all that also applies to the piano version but listening in this form is quite a different experience. There is greater clarity of purpose and the musical sense of the work is easier to appreciate. The main price to pay is some loss of the visceral element but Hayroudinoff and Stone still create plenty of excitement at the climaxes. Listening to the work in this form is a good way of revamping enthusiasm for it. Prepare to be blown away when you next put the orchestral version on. A high level of commitment and great team work from Hayroudinoff and Stone are evident throughout their performance. They adopt relatively fast tempi in the outer movements (two orchestral versions I know take 62 and 66 minutes) but there is never a sense of hurry. Despite the technical challenges, the emotional content of the work is all there. The pianists are backed up by a first-rate recording. This is not one of those two-piano recordings for which one might wonder whether a stool was being shared � the aural image is just right. Presentation is excellent too with an authoritative essay by Eric Roseberry. An unqualified success - this will be compulsory and compulsive listening for admirers of DSCH. Footnote: The western première of this work will be given by these artists on 26 June 2005 in Cambridge, UK, see: http://www.dschjournal.com/events/dsevents.htm#opus43a. Further details will presumably appear on the UK Shostakovich Society website nearer the time, see: http://www.shostakovich-uk.com/Forthcoming.html.